The Friends of Jefferson Barracks has been a strong supporter of Boy Scout and Girl Scout Activities. Through the years numerous scouts have completed projects in the park that helped them meet the requirements for these awards. 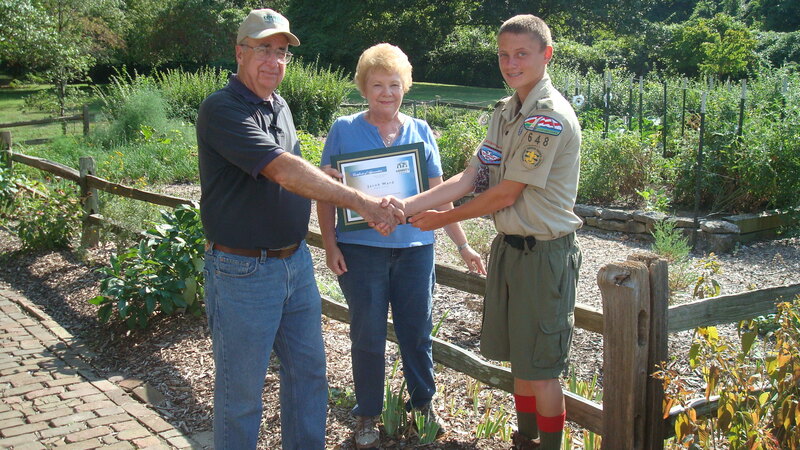 The Friends of Jefferson Barracks and St. Louis County Parks are avid supporters of the Boy Scout Eagle and Girl Scout Gold Award projects in Jefferson Barracks Historic Park. These projects give the Scout an opportunity to plan, develop, and give leadership to others. These projects are evaluated on the benefit to the organization being served and on the leadership provided by the candidate. Pictures of some of the many completed Eagle Scout or Gold Award projects in Jefferson Barracks park. Clearing of World War II foundations at the foot of the Great Rivers Greenway Bridge over the Union Pacific Railroad tracks. Cleaning and restoration on the north entrance to Jefferson Barracks Historic Park. Construction of a wood arbor for weddings and demolition in preparation for a new brick walkway and original water pump installation. Installation of the flagstone foundation under the wood arbor. John and Bonnie Lorenz with Eagle scout in front of completed split rail fencing around the garden at the Laborers House. Girl Scout Gold Award project that consisted of clearing, cleaning, and painting the hand rails and shelter supports in the area around the Lewis and Clark overlook behind the amphitheater. New bench at the Amphitheater. Stone cannon mounts for the cannons located in front of the Powder Magazine and Ordinance room museums. Construction of candle light holders to be used at night time park events. On behalf of the Friends of Jefferson Barracks and St. Louis County Parks we extend best wishes to all for completion of your park project and for continued success as a leader throughout your life.